Big events coming up for Postcards from the Parks in 2018! Though I have been back in Vermont for the last few months that doesn't mean Postcards from the Parks has been put on the back burner. In fact, I have been hard at work in the studio, planning, networking, and promoting on behalf of protecting our public lands. Like the image of the raven above, I'm getting ready to take to the air and spread my wings to bring Postcards from the Parks to thousands of people in 2018. As a result, there are three big things coming up this spring as I continue this project and hope all of you will follow along! Packing my bags for LONDON! Coming right up this week, I will be packing up all of my PFP work and black and white photographs and hopping on a plan to London for the first public showing of the Postcards from the Parks project! I will be spending a week as the guest artist at TASIS England to share about my work, this project, teaching workshops, and having a solo exhibition of my work in the Fleming Gallery. 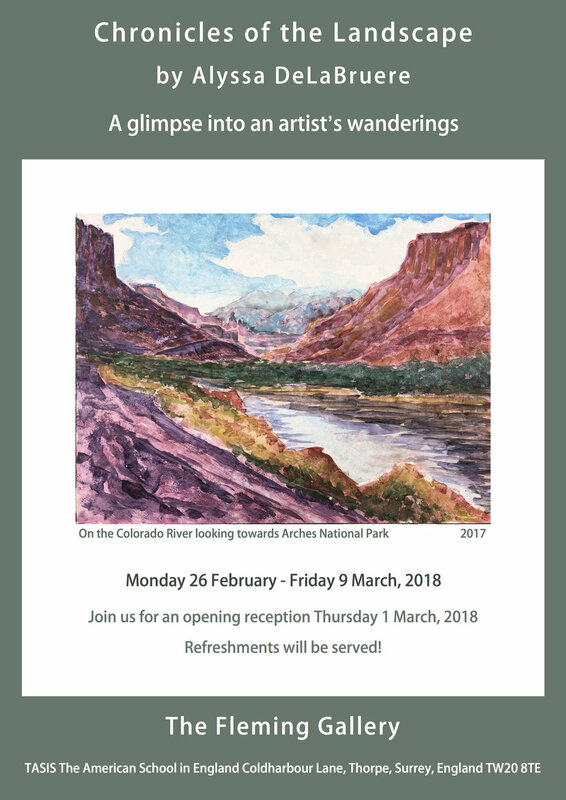 This is a very exciting kick off to what I hope will be many exhibition engagements to share my work and the important message about protecting our National Parks and Monuments. Wish me luck getting all this art work on the plane and across the pond intact!!! Thank you to John Smalley, Perrin Tingley, and Camila Aguais for their belief in me and this project and creating this incredible opportunity for me to share my work! Stay tuned for photos and blog post coming your way from the UK! Postcards from the Parks is headed to YALE! Coming up on April 19th, I am thrilled to announce that I will be a guest presenter at Yale University to share about my Postcards from the Parks project! I am honored and humbled to have this wonderful opportunity to share with Yale undergrads who are vested in both art history and environmental studies as a contemporary female artist/activist who is using art as a grassroots campaign to bring awareness to this poignant issue in our country. A special thank you to Professor Monica Bravo for the invitation and for teaching this incredible course entitled "Visual Culture of the National Parks". I can't wait to present and bring my art work along for a pop-up interactive exhibit and workshop! I am hopeful that this engagement at Yale is the first of many visits to college campuses and organizations. If you are interested in have me present about Postcards from the Parks at your school or organization, Send me a message via the form at the bottom of this post! After months of planning, routing, rerouting, considerations to weather, being frugal with costs, the itinerary is set, flight is booked, and Postcards from the Parks Road Trip #2 is set to hit the trail on April 23, 2018! I am so excited to get back out there to chronicle the landscape through paint and words, meet people, collect testimonials, chat with the locals and concerned rangers alike and bring it all to you through artwork, photos, and blog posts! The trip will kick off at epic Zion National Park in Utah and work my way to San Francisco Bay and Muir Woods National Monument! On the way follow along to experience an artist's view of Vermillion Cliffs, Grand Canyon, Joshua Tree, Channel Islands, Pinnacle, Sequoia, King's Canyon, Yosemite and the Sierra Nevadas...and all the other stop offs and detours along the way as the trip unfolds! After months in the studio creating new work, teaching and sharing, planning for exhibitions, and having the first of hopefully many college presentations, I am so ready to pack up my paints, easel, tent and gear to bring the parks into focus and use my humble gifts to open people's eyes to these breathtaking places. So, yes, there is a lot going on here with Postcards from the Parks! It is my belief that one person using their gifts, passionately using their voice, can be the pebble making one small splash in the lake that sends ripples for thousands of miles across the water! You play an important part in that momentum in creating awareness, action, appreciation, and protection for our National Parks and Monuments. Without your generosity of contributions big or small, this project could not be possible. Without your willingness to read my posts, tell your friends and share along, word of what I'm doing here with PFP wouldn't spread. Without all of us joining together as citizens using our collective voices and votes OUR public lands will be be at risk. If you are reading this, thank you for your support, being a part of my PFP tribe of followers, for sharing this post or the website along to others, and for caring about protecting our national treasures! Postcards from the Parks is a one woman grassroots project funded solely by myself and contributions from people like you. I am actively trying to raise $5500 to help pay for Road Trip #2. If you feel moved to contribute to the cause, follow the link below. Send a message to Alyssa and Postcards from the Parks! Thank you for your message and interest in Postcards from the Parks! I will be in touch soon! Older PostSo... What is next for Postcards from the Parks?